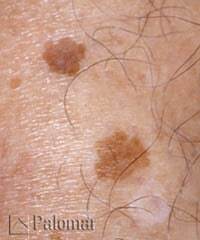 Sun spots are little dark spots that form on the skin. They are caused by exposure to the sun over an extended period of time. Some people get many and some get only a few. Because they are commonly called “ Age Spots”, many people find them embarrassing and actively search for ways to get rid of them. Sun spots can also be called Melasma. Although men can get them too, the condition is commonly associated with the female hormones estrogen and progesterone. It seems to be more common in women taking oral contraceptives, during pregnancy and those taking hormone replacement therapy (HRT). Skin Lighteners such as Hydroquinone can significantly reduce brown patches on the skin. Prescription Creams are the most effective while over the counter lighteners only help minimally. Microdermabrasion and Chemical Peels are also very effective with the exfoliation of the outermost layers of the skin. This process uses light abrasion and exfoliation to help reduce the severity of the sunspots. Usually, a series is recommended and can be partnered with a skin lightening cream for better results. Medical Chemical Peels are currently becoming an extremely popular tool to fight sun spots. Most peels now put “boosters” and lighteners in the peel itself to penetrate deeper into the epidermis. Lasers/ Ipl – Photo-facials are extremely effective and are currently more affordable than in the past. A blast of light energy hits the brown spots and helps to reduce them, and in most cases, get rid of them completely. Certain skin types are not candidates for this procedure, and wearing sunscreen daily is a must! Many of the above treatments can be partnered in a series to help treat and reduce sun spots extremely effectively. While wearing sunscreen regularly can help to minimize sun spots, it will not actually eliminate the spots entirely, but help them from getting larger and darker. Many people opt to treat at least once a year to keep sunspots to a minimum and their skin looking wonderful! "Look and feel great with our sun and age spot removal treatments!"